Chava Eichner of Flavour Photos says: Homemade seitan is one of the easiest and quickest things to make. If you can't find vital gluten flour from a local health food store, try online. See below for suggestions. NB sometimes it's called gluten flour or seitan flour). 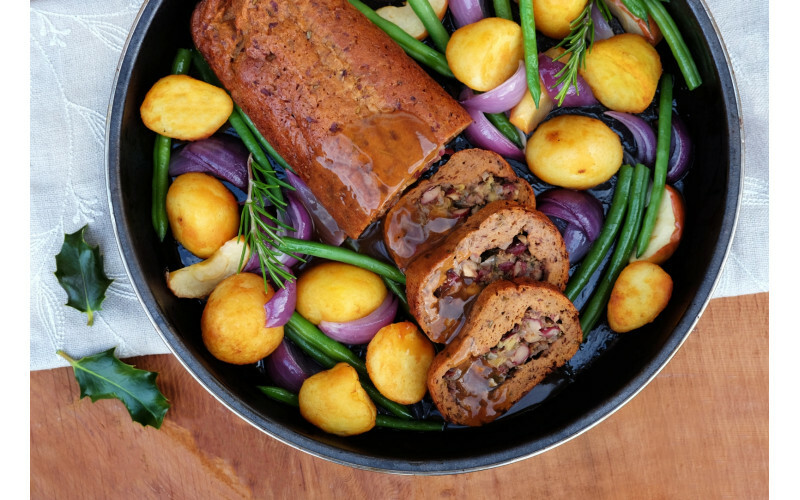 It is very good value compared to buying ready-made vegan meats and you'll be making your own roasts and sausages in no time at all! This recipe can also be made ahead of time then sliced and reheated. Amazon also sell several brands at varying prices! Make the filling by sautéing the onions until softened. Add the apple pieces, hazelnuts and prunes and cook over a medium heat for 3-4 minutes. Stir in the kidney beans and stock cube. After a couple of minutes mash the filling (particularly the beans) roughly with a potato masher. Season with salt and pepper. Set aside while you prepare the seitan. Combine the gluten flour, rosemary, garlic salt and yeast flakes in a mixing bowl. In a blender mix the vegetable stock, crushed garlic, remaining kidney beans, tomato puree and olive oil. Make sure to use quite strong stock as this will give flavour to the roast. Pour the liquid into the dry ingredients and stir until the dough begins to come together. Knead for a couple of minutes until you have a soft dough. Place a large piece of kitchen foil on the counter. Spread out the seitan with your hands on the foil until you have a rectangle, slightly larger than an A4 sheet. If you see any holes make sure to pinch them together. Place the filling into the middle on the seitan. Use the foil to help you roll up the roast as tightly as you can like a large Swiss roll (or sushi). Ensure the foil is well wrapped around the roast. Twist the ends very firmly together as this helps to form a nice shape. Bake in a preheated oven at 180°C/350F˚Gas Mark 4 for 60 minutes. Turn the roast a few times to make sure it cooks evenly from all sides. Serve with gravy and all your favourite festive trimming. TIP: Try preparing this a few hours before eating and keeping it wrapped. The outside of the roast softens up nicely in its foil wrapper, which makes it very easy to slice. You can then simply reheat it alongside the veggies.